Spring holidays have turned me into one of those cook-on-the-weekend-for-the-whole-week kind of people. I've quite enjoyed relaxing and having dinner already "done," but it's left me without any meal plans. Last week, I did make some homemade spaghettios (I used this recipe from Picky-Palate except with a whole brick of white cheddar and no shredded chicken), but those are gone, so I guess that I'm going to have to get back to the whole meal planning thing. At least this Thai chopped chicken salad is making it much easier to do that. On the subject of all things delicious, I accidentally over-baked my banana bread (yes, it's probably one of my top posts because I reference the recipe so often myself...) last week, too, and I turned them into chocolate-dipped banana bread truffles. They're so good that even the dogs loved them (note: I didn't share the chocolate part with them). 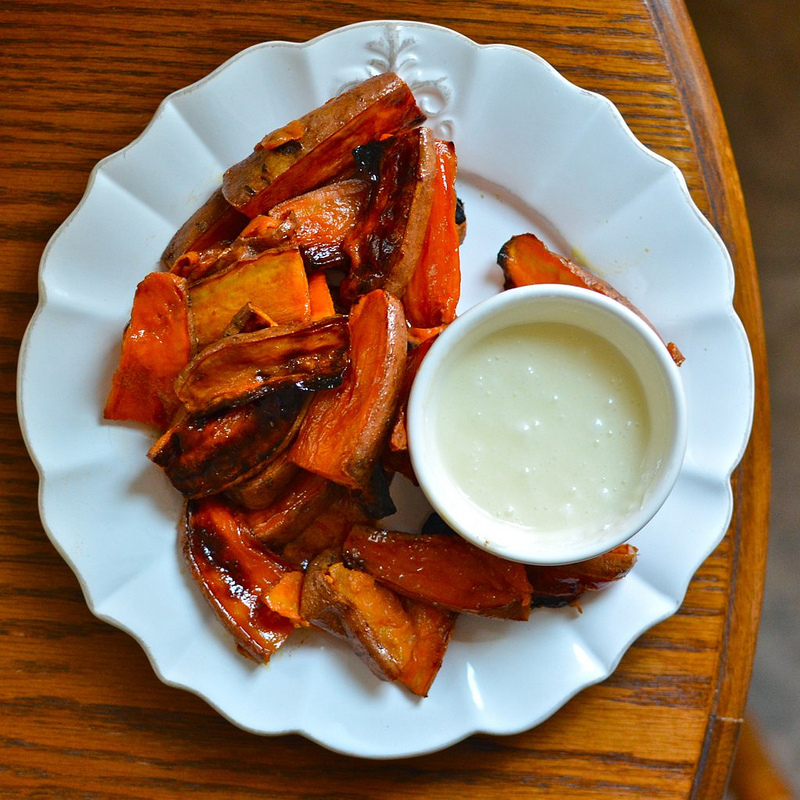 Speaking of sweet things, these sweet potato fries make an excellent sugary side dish or a "healthy" dessert to finish off a light dinner. You'll definitely want to serve them with the vanilla dipping sauce, too. Slice sweet potato in long, thin slices about 1/8 to 1/4 inch thick. Spread sweet potatoes on an aluminum foil-lined, rimmed baking sheet. Note: the aluminum foil is not necessary, but will make clean up a lot easier. 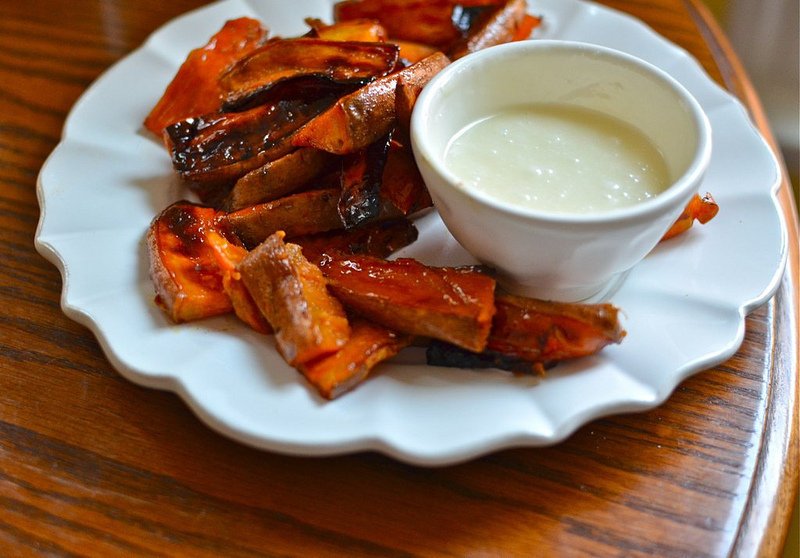 Drizzle your sweet potatoes with a generous amount of olive oil. Stir them around on the baking sheet to coat them with the olive oil. Sprinkle sweet potato fries with a little salt and a large spoonful or two of brown sugar. Again, stir them around on the baking sheet to coat them evenly with the salt and brown sugar. 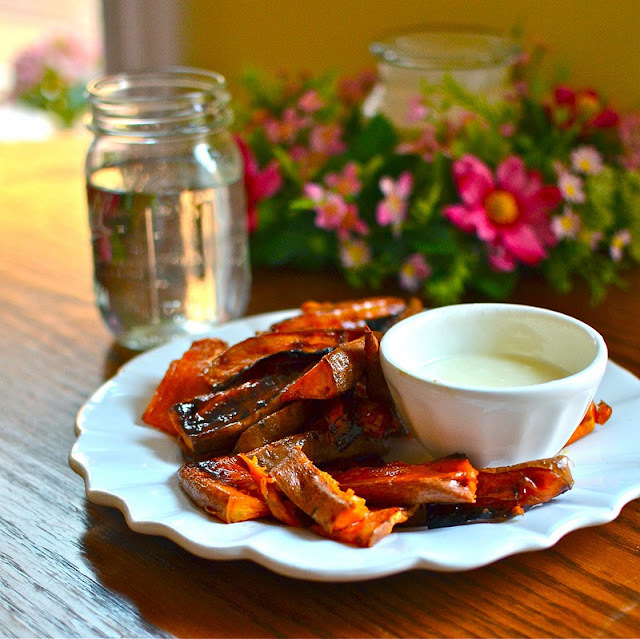 Bake sweet potato fries for 25 to 30 minutes or until they are soft on the inside (stick a fork into one of them). 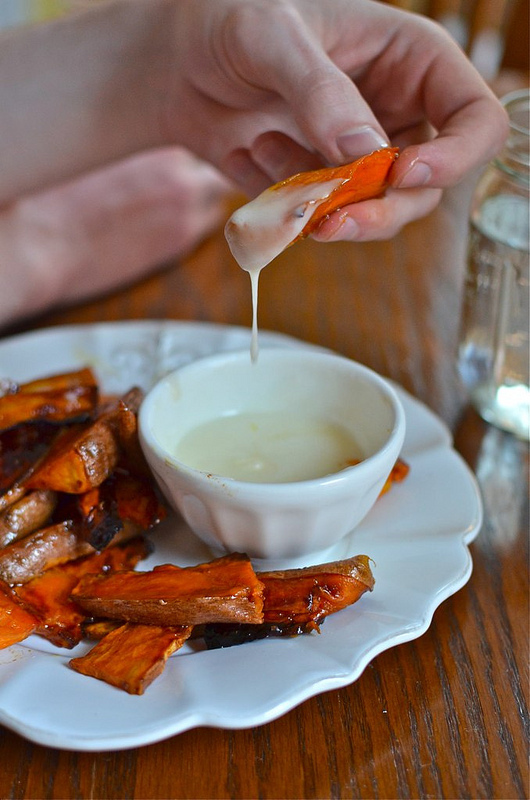 While sweet potato fries are baking, prepare the vanilla glaze. In a small bowl, soften the butter by microwaving it for about 10 seconds. Mix in about half the powdered sugar and then add the milk and vanilla. Add the rest of the powdered sugar and stir until a smooth glaze forms. You can adjust the thickness of the glaze to your personal preferences by adding more sugar or more milk. 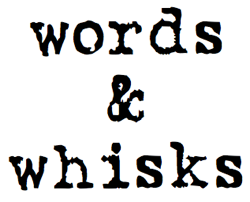 Be careful adding the milk, though, as a little goes a long way! 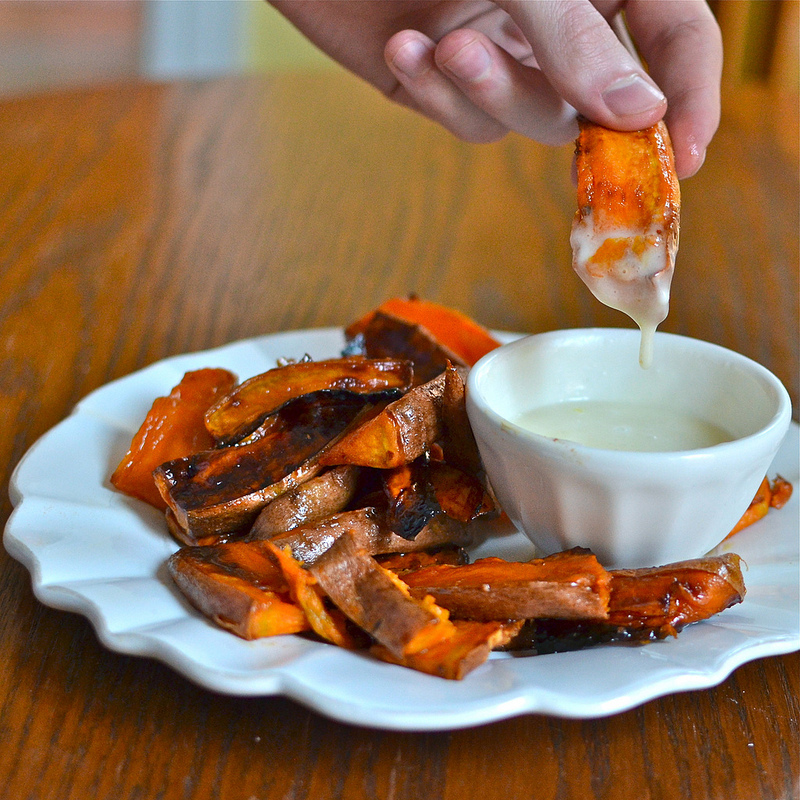 Serve sweet potato fries with a side of the vanilla dipping sauce. Enjoy! Makes about enough for two to share.